Mike Russell defeats an in-form Siddharth Parikh to win the Americas Cup, after defeating Phil Mumford to win the European Open only a week earlier. The match ended 1250-886 with a string of high breaks. Rob Hall surprised everyone with an outstanding performance against Mike Russell in the final of the Vimy Ridge Classic to win 484-301. The performances by the Canadians took many by surprise with three players making it to the Quarter Finals of both competitions, Shane Bartelette reaching both. Kevin Augusta recorded his first ton. Well done Canada ! We have a new record set by an incredible performance from Dhruv Sitwala. In his match with Gaye Jones he broke, Gaye took 3 off the red and then Dhruv scored an unfinished 400. Game over ! And, remember that the baulkline rule was in force. 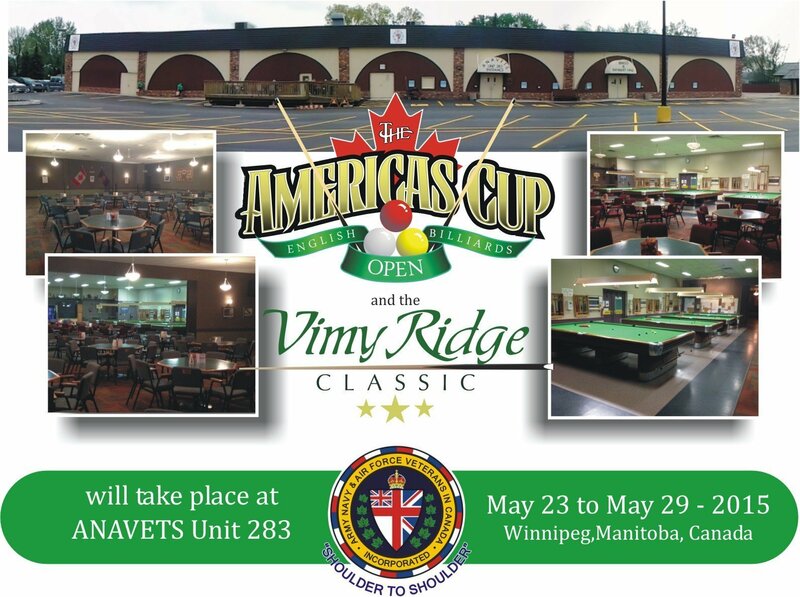 The 2015 Vimy Ridge Classic and 2015 Americas’ Cup were held at the Anavets Assiniboia Unit #283 club in Winnipeg, Canada between Saturday 23rd & Friday 29th May. The Vimy Ridge Classic is a Level 3 World Ranking event with £2000+ prize money and full ranking points. It was played on the timed format and acted as a warm up event for the main Americas’ Cup which is a Level 5 Major World Ranking event with £8000 prize money and double ranking points. As last time, the Americas’ Cup was played on the single game, long-up format, replicating how the local players play in the Winnipeg Veterans English Billiards League. For more information please visit www.amcup-canada.com. To learn more about the battle of Vimy Ridge see the Vimy Foundation website.